A 37-year-old man had visited Senegal and The Republic of Gambia and had stayed there for two months. Upon his return, he presented with complaints of fatigue, headache and fever. He also stated that he remembered being bitten on several occasions by insects. 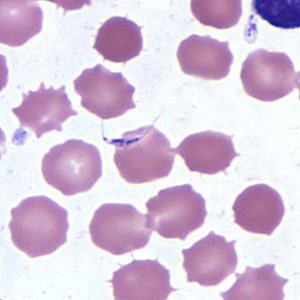 Laboratory testing included a blood smear stained with Wright-Giemsa. Figures below show what was observed on the smear at 1000x magnification. Enter your answers in the comments section. First three correct entries are entitled to Surprise Gifts as usual! 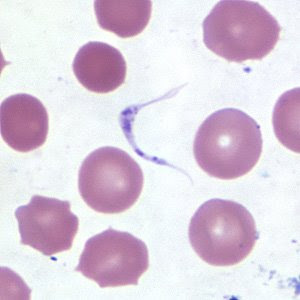 Diagnosis:Staning reveals blood protozoan parasite Trypanosoma.prominent nucleus at centre and kinetoplast anteriorly with short single flagellum(undulating membrane not appreciable).This arrangement shows this could be Promastigote stage of Trypanosoma spp.Person returned from Africa as he has stated and insect bites which confirms of tse-tse fly vector for causing African sleeping sickness.T.gambiense infection is confirmed and Rebublic of zambia was reported to be endemic for African sleeping sickness and vector Tst-tse fly found to be more there . 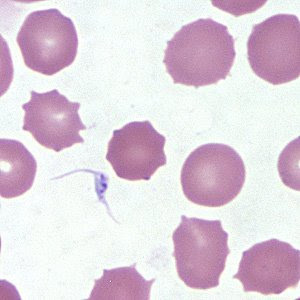 Trypanosoma brucei species may be T. b. gambiense (or) T. b. rhodesiense. HINTS: Trypomastigote with small kinetoplast at posterior end, a centrally located nucleus, an undulating membrane, and a flagellum running along the undulating membrane. Trypomastigotes are the only stage found in patients. Trypomastigote has a small kinetoplast at the posterior end, a centrally located nucleus, an undulating membrane, and a flagellum running along the undulating membrane. Trypomastigotes are the only stage found in patients. 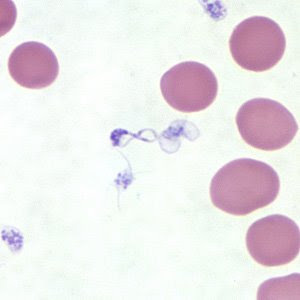 Trypanosoma brucei gambiense or rhodesience, both morphologically identical.